So I've been playing with Hero Arts Summer Memories digikit. This frog is just too cute. I mixed him with some paper from THIS digikit - you may have noticed that I use it a LOT. I adore it. And of course I HAD to cover him in Glossy Accents . Hope you have a fab weekend - I am off away with my family - my sister is over from Canada. HOORAY. That frog is great. Love his nubby fingers and toes. Do they call them fingers and toes on frogs? I can see why you love that background too. Very fun! That frog is adorable! So cute!! Have fun with your sister! THAT is a cute frog!! lovely card! Really fun colors to this card! Very cute! What a happy card, really funny and I love the colours of the blue and green together ! Oh! He's so cute! Love the shine and pretty colors! Such a lovely froggy... all nice and shiny. Enjoy your time with the family Lucy. I really like this card! Wonderful colors. This sweet little frog. 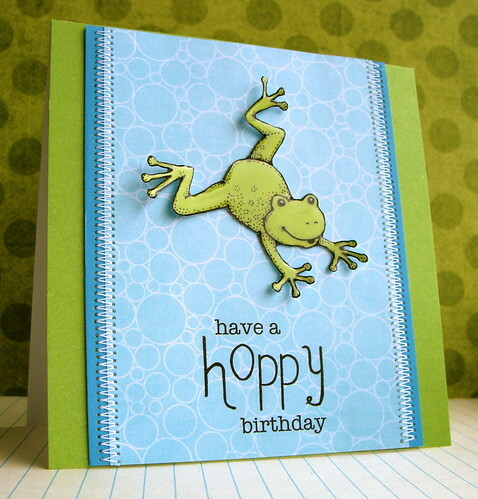 What a fabulous, fun card Lucy, love that frog and how you covered him in with gloss accents. Enjoy your time with your sister. 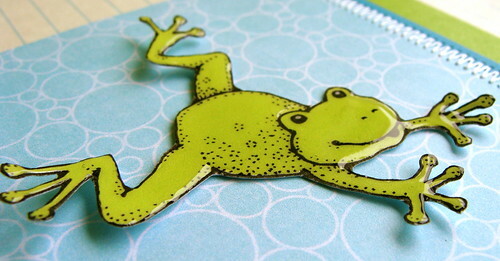 Beautiful clean and crisp card..the frog is super cute, and I love the gloss! TFS! such a fun card, super design! Makes me smile! !